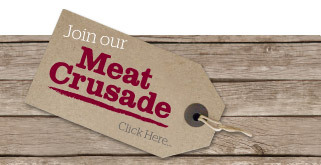 John Penny & Sons have launched a new national campaign, The Meat Crusade. The aim is to put quality butchers meat back onto every dinner table in Britain by raising awareness in quality and taste and offering a greater understanding of how ethical meat operations work. As a farmers and mat wholesalers, we know that butchers offer a fantastic product and they are also the friendly face on the British high street who can offer a wealth of advice on how best to cook your meat. We’ve created a brand new range of recipes using cost-effective cuts of meat and easily sourced ingredients in our Meat Crusade cookbook which you can order here. Welcome to The Meat Crusade blog where you will find out all the latest news from the campaign as well as profiles on some top quality butchers some of whom John Penny & Sons supply and some that we don't but we know that they are fantastic. The improved facility has provided Stuart with the capacity to expand his product range and produce his very own award winning sausages and dry cured bacon made with meat from trusted suppliers. Stuart creates his own sausage rolls and range of pies, selling over 700 pies every week. He also offers an excellent range of ready to cook meals and marinated meats from apple and mustard pork steaks to minted lamb stir fry. The shop has recently introduced some South African products, such as Biltong, in response to customer demand, as well as a number of vegetarian dishes to encourage customers to shop for the whole family in one trip. 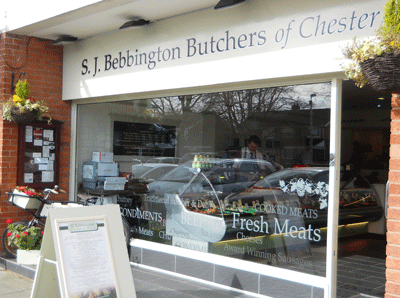 S J Bebbington was awarded a finalist in Britain’s Best Butchers Shop 2012 and has received multiple gold awards for a variety of products over the last decade.